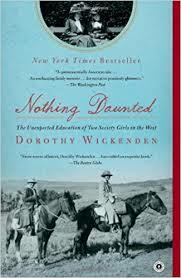 Nothing Daunted: The Unexpected Education of Two Society Girls in the West – In the summer of 1916, Dorothy Woodruff and Rosamond Underwood, bored by society luncheons, charity work, and the effete men who courted them, left their families in Auburn, New York, to teach school in the wilds of northwestern Colorado. Nearly a hundred years later, Dorothy Wickenden, the granddaughter of Dorothy Woodruff, found the teachers’ buoyant letters home, which captured the voices of the pioneer women, the children, and other unforgettable people the women got to know. In reconstructing their journey, Wickenden has created an exhilarating saga about two intrepid women and the “settling up” of the West.